Now this dessert is dairy-free in STYLE! Coconut whipped cream layered with fresh berries. it is decadent and delicious. Coconut whip is simple to make and the perfect replacement for cream. It is heavy however, so use just a bit in your cream layers. You will not miss the dairy in this dessert. The day before: put 1 can of whole coconut milk in the fridge. This is essential to make the cream. 1.Take out coconut milk and open side with cream on top. Carefully scoop out the cream (try not to get any of the liquid) and put in a large bowl. Add a just a touch of pure vanilla extract, finely ground sea salt and maple syrup). 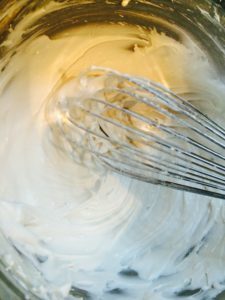 2.With your whisk and good ole’ arm power, or your hand blender, whisk the cream until light and fluffy. Set aside. 3.Cut fruit into bite-sized pieces, using as much or as little as you need. 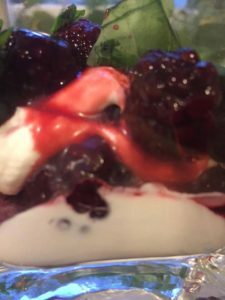 5.In small glasses, start to layer your parfait (add cream, then strawberries, then cream, then blackberries, then cream – you get the picture). Note: if you want more of a crunch, then add in some slivered almonds or granola!